Management: Surgical removal of tumor and removal of possible causative factors to avoid reoccurrence. Hereditary gingival fibromatosis © 2009 Farlex, Inc.
A genetic disease that is painless, slowly progressive and dependent on the oral hygiene. Gum enlargement usually begins during eruption of teeth or puberty and it can completely cover the teeth. Management: Surgical correction but recurrence is likely after surgery. Inflammation and enlargement of the gums caused by an increase in the number of cells, this gum disease can be idiopathic (cause unknown), drug related, inflammatory or hereditary in nature. Local irritants such as plaque, food debris and ill-fitting dentures can give rise to gum swellings. Management: Removal of causative factors and surgical correction. 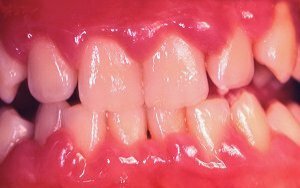 A rare genetic defect whereby plasminogen is deficient, its manifestations include swollen, painless, nodular and ulcerative gums. Management: Plasminogen replacement therapy and avoid trauma to gums. 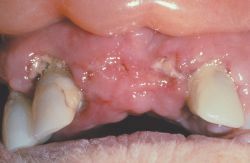 Growth on the gums can be benign or cancerous (squamous cell carcinoma, Kaposi’s sarcoma, leukemia). Management: Biopsy to confirm whether the lump or swelling is cancerous and corresponding treatment. Hormonal changes may result in generalized gum swelling (pregnancy gingivitis) or a discrete lump (pregnancy epulis or pyogenic granuloma). Management: Practice good oral hygiene. Also known as pregnancy tumor, it may cause a lump on the gums and is most likely to occur in children, younger adults and pregnant women during their first trimester. Management: No treatment needed as pyogenic granuloma that occurs during pregnancy tends to heal spontaneously but surgical removal can be opted. A dental appointment may be needed for teeth cleaning and to remove any irritative factors. Scurvy © 2009 Farlex, Inc.
A condition caused by deficiency of ascorbic acid (vitamin C) which can lead to spongy, swollen bleeding gums. Management: Intake of Vitamin C.
These are few of the many causes for gum swellings and lumps. If you have any of the above symptoms, it is wise to have your gums checked by your dentist for further examination and investigations to determine the underlying cause. Always remember to maintain a good oral hygiene to ensure your gum health and to prevent the occurrence of any problems in your mouth.